For some, New Year’s Eve is a time to party. For me, it is a time for reflection. I’ve just managed to somehow wrangle the kiddies into bed. Little A didn’t want to go; he was running around naked refusing to put on his pajamas. Big A thought it was a big joke. So now I am a little bit too exhausted for partying. But often I am just as happy having reflective time, focusing on my goals and aspirations, blessings and losses in the year gone, and hope for the new year. 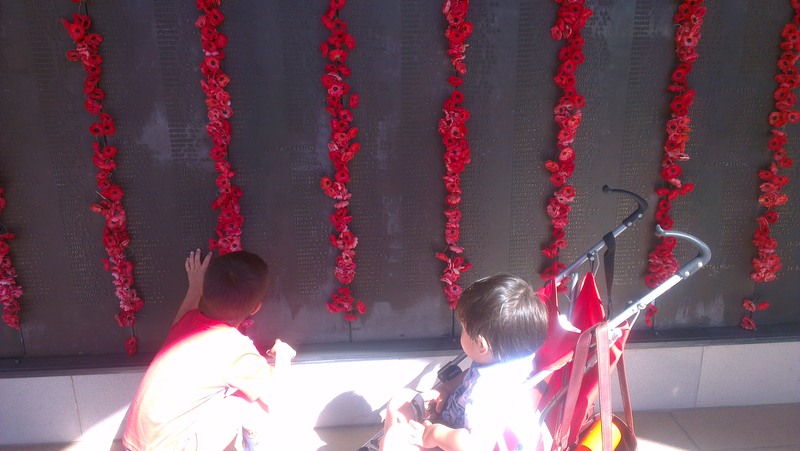 Now that I am back in Canberra, I initiated my boys into my favourite New Year’s Eve tradition — visiting the Australian War Memorial to experience the last post ceremony. It is a sombre and touching experience. If you have never been, you can view the daily webcam online at 4.55pm. In short, it is a meaningful ceremony that includes the laying of wreaths, and concludes with a bugler playing the last post. 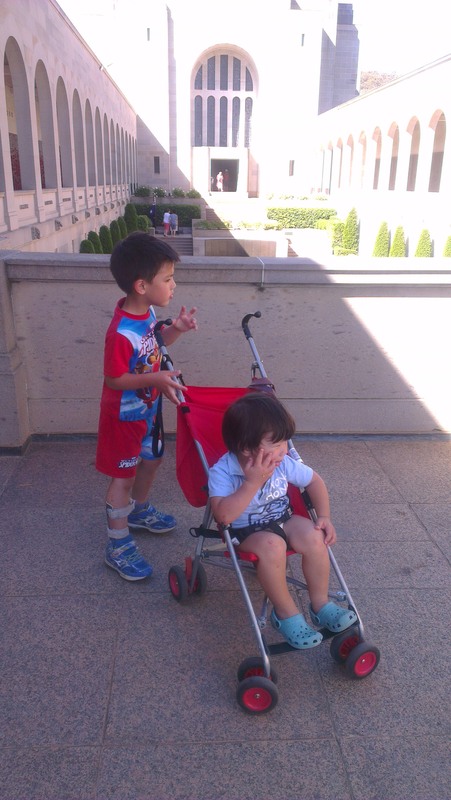 I especially wanted to take 2A to the Australian War Memorial so that I could show them their great-grandfather’s name on the roll of honour. My father’s father went to war to fight the Japanese, leaving behind a farm, a wife, three kids, and one on the way (my Dad). My grandfather didn’t have to go: as a farmer he was exempt from any pressure but he felt it was the right thing to do. Unfortunately, he was killed in Papua New Guinea in an horrific air disaster when a US bomber didn’t take off properly — before he even saw a single battle. My great-grandfather was in one of the trucks waiting by the runway. He didn’t stand a chance. My grandmother, meanwhile, was left to raise four children and manage a farm. There was no electricity in those days, and the toilet was a shed in the back garden. It must have been isolating for her. Yet she managed four kids and a farm, and even snared herself a new husband when she went to a party all fashionably kitted out in a home-made ensemble. 2A didn’t really understand all of this family history. When I said we were going to see their Grandpa’s Daddy’s name, they were still expecting to see a real person. 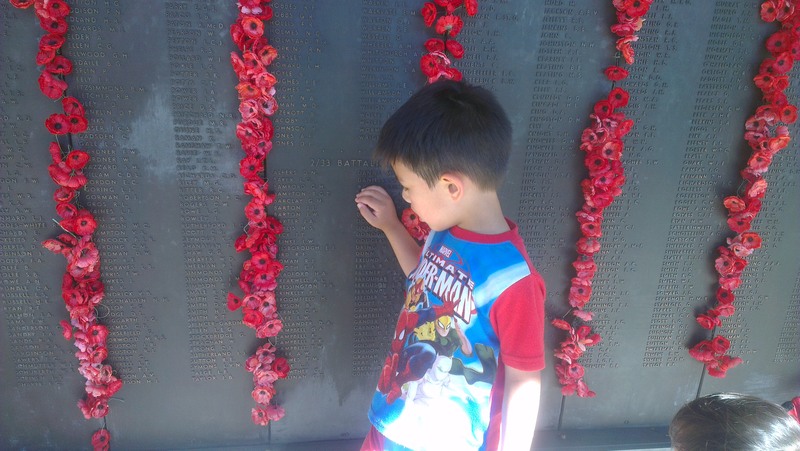 Big A was interested in his great-grandfather’s name on the honour board, and kept touching it and feeling it. 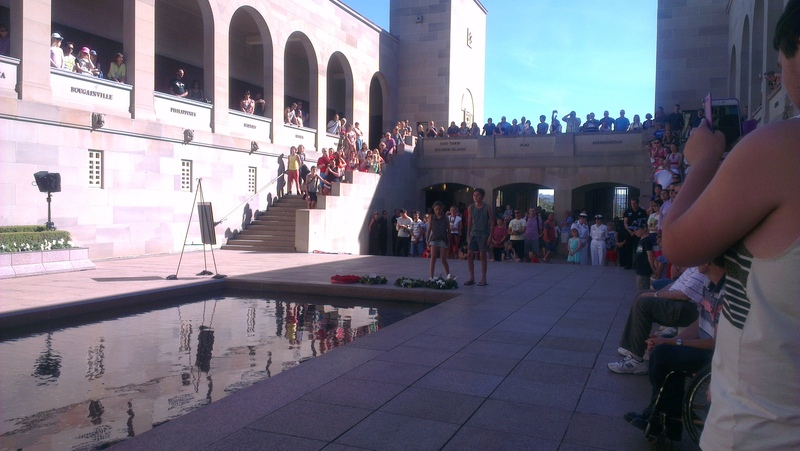 I am not sure if this is appropriate at the war memorial or not; we meant no disrespect. He was quite concerned that his great-grandfather was dead, and wanted to know why he died. Which one is it Mummy? Little A on the other hand, was NOISY. 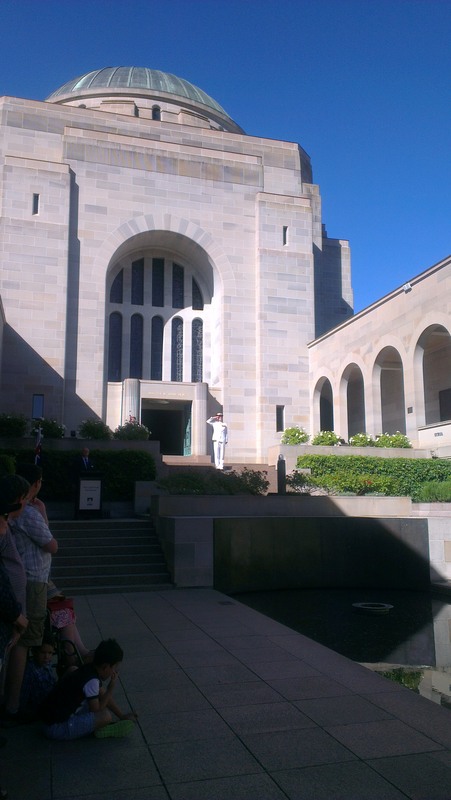 He wanted to make echoes in the tomb of the unknown Australian soldier. And during the last post ceremony, especially the minute of silence, he wanted to share with me (loudly) that he wanted a gummy bear. At least he stayed in the stroller and didn’t run around. Can we go home now? 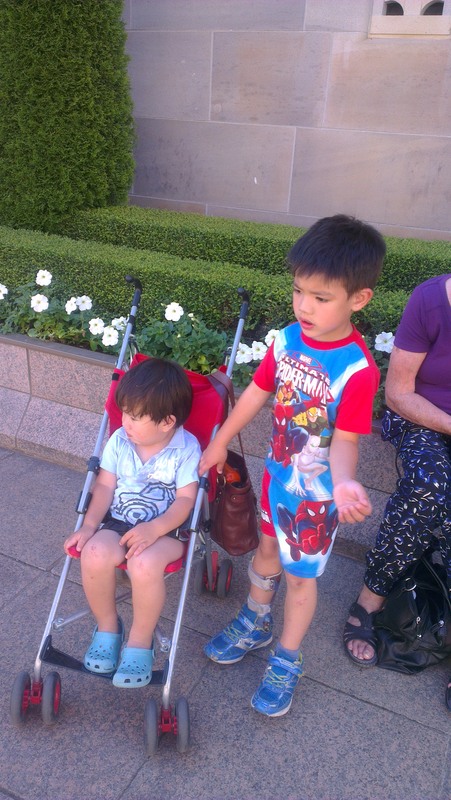 My kids waiting for the last post to finish. Still, despite my visit with kids in tow not being as quiet as pre-kids, it was still a touching experience. As I look towards 2015, I am filled with hope. Being in touch with my background reminded me that I come from a family that is skilled in dealing with adversity. Just like my grandmother, I can keep going no matter what life throws at me. (Comparatively, I’ve got it easy — I have electricity and a flushing toilet for starters.) And seeing the sacrifices that people like my grandfather made to uphold and protect the society and freedoms that we have come to expect in Australia, makes me realise how incredibly lucky the kids and I are. I can feel that 2015 is going to be a good year. Best wishes to you and your family for a prosperous New Year filled with dreams achieved.